© Copyright 2019 NZME. Publishing Limited. A Whangārei father wanting to stay home and look after his premature son felt he had been left "high and dry" by an apparent gap in legislation, however he now has a glimmer of hope after MBIE asked him to contact it. 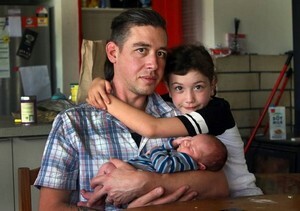 Despite working, Regan Morgan has been unable to secure paid parental leave to look after his newborn son, Robert, because his wife, Alison, was not eligible for paid parental leave. Alison has fibromyalgia and chronic fatigue syndrome. Fibromyalgia is characterised by symptoms of widespread muscle and joint pain, stiffness and fatigue. Due to her health conditions she had not been working before the pregnancy, deeming her ineligible.